Acid trip at 120 frames? 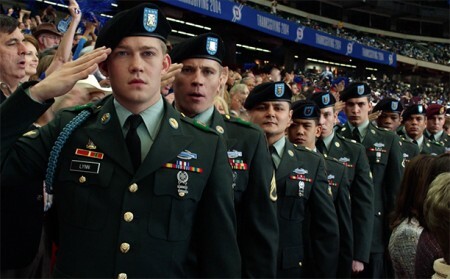 Ang Lee's film adapted from the bestseller Billy Lynn's Long Halftime Walk was one of those later inspirations of the New York Film Festival, chosen after the Main Slate had been selected to be featured as a glitzy festival premiere. Lee's Life of Pi four years ago, a similar NYFF collaboration, was, similarly, technically innovative and a glitzy premiere. But that one was more successful, and made more sense in the first place. Motion capture CGI of animals enabled Lee to film Yann Martel's unfilmable sea odyssey - that zoo-full of escaped animals, that saga on a lifeboat with a Bengal tiger could never have been visualized before this technology. Maybe Ang Lee's Life of Pi isn't deep, but it's a glorious adventure. This time Lee wanted to try out a different innovation, shooting at a zillion frames a minute (actually 120 fps) to achieve a hyperreal visual effect augmented with 4K and 3D. The trouble is that most movie theaters haven't the technology to project the film as it was made and shown at Lincoln Center. So it just looks like any other film, which may be for the best. Was this technical experiment necessary? I like this film, mainly because I like the star, young English actor Joe Alwyn, who plays Billy. He tremendously holds the screen. I can also see what's going on in Ben Fountain's novel as adapted by Jean-Christophe Castelli, even though at the end, you go, "Is that all?" Something is missing - the deeper ironies, postmodern media savvy, and emotional complexities of the book. This lack remains, despite higher resolution and filming everything, the heroic Bravo squad's and Billy's long day as patriotic mascots at a big Texas Thanksgiving football game, as he, especially, flashes back to the war in Iraq they've just come from, and are soon going back to. All that can't make up for what doesn't get to the screen from the book. Billy's heroic exploit, as it's seen (he says he's not a hero, just a soldier) where he tried to save his beloved guru and mentor 'Shroom (a sweet, philosophical Vin Diesel) in a fire fight, was filmed and the nation saw it, so Billy, who got a Silver Star, is famous. The Bravo group has been on a boozy, tacky victory tour for two weeks, and have just now come to Billy's home state of Texas, where his sister Kathryn (Kristen Stewart, excellent and totally unglamorous), only now recovering from a terrible car accident, who loves Billy and hates the war, wants him to use his special status to claim PTSD and get out of combat. And he considers this. He's also a virgin, and he falls for a classy, Christian cheerleader, Faison (Makenzie Leigh), who wants him. Meanwhile the squad is surrounded by handlers and the oily football team owner, Norm Oglesby (Steve Martin), and a movie deal is spoken of. All this is going on, and then comes the halftime show where the squad is on display with Billy in front. Joe Alwyn is a physically impressive young man, and his big, boyish, almost babyish face, big blue eyes and big smile are riveting. The conceit of the story is that the halftime show, with its fireworks and explosions and loud drum rolls and being within two feet of a prancing singing Beyoncé, brings back that day of combat to Billy, not for the first time, but at higher intensity and greater length, down to his hand-to-hand killing of an Iraqi and him and his sergeant Dime (Garrett Hedlund) falling into each other's arms when they know 'Shroom is dead for sure. The logic of the hyperreal imagery Lee worked for seems this. The boys wake up with a hangover that morning, particularly Billy, who asks for Advil all through, but gets it only after everything is over. They do some drinking, and they smoke some dope. Just civilian life, which now seems more chaotic than the front, but above all this overblown crazy outpouring of American kitsch, must seem to the squad, and to Billy, like an acid trip. The amped-up clarity of images was a way of expressing that - though unlike the motion capture CGI for the Bengal tiger, it wasn't really necessary, and reliance on the images, and recreation of the chaotic stadium scene and of scenes from the squad's Iraq experiences, down to the face of a boy when they take away his father in a night raid of a house - though all this is impressive and memorable, just may not have been quite what Ben Fountain was getting at in his book. I haven't read the book, but I want to. It's been called "the Catch-22 of the Iraq war," and that's good enough for me. It's obviously a hard look at modern combat, the intimacy among soldiers, the morality of the "war on terror," heroism vs. doing your job, and the way America looks at war and at its soldiers. The latter, though central, is largely only implied in the movie. Tellingly, Billy says he can't understand why he is being celebrated for "the worst day of my life." Once again as so often happens with a film adaptation of a complex book, one feels deprived. I'm also not convinced the normally gentle and peaceful (and must I point out, Taiwanese, not American?) Ang Lee was the man to direct such a movie. Billy Lynn's Long Halftime Walk, 113 mins., debuted 14 Oct at the NYFF. Screened for this review in regular 2D format at a small cineplex auditorium in Emeryville, California 22 Nov. US release 11 Nov.; UK, 10 Jan. 2017.